We aren't terribly fashionable around here. 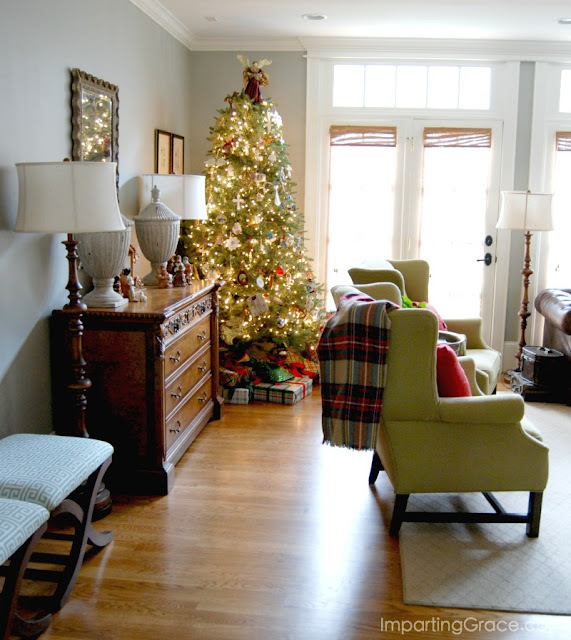 We have just one tree, which stands in the corner of our living room. 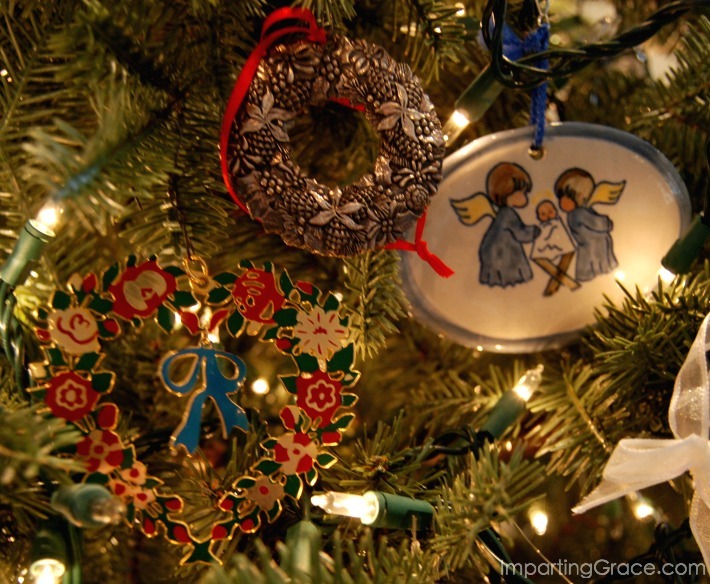 Our tree is filled with ornaments old and new, most of them loaded with meaning or memories or both. 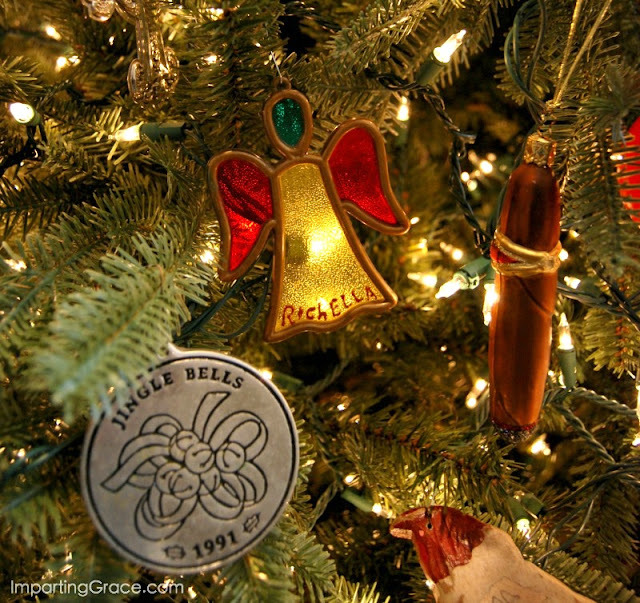 The oldest ornament on the tree is this stained "glass" angel my Aunt Marjorie made for me in the late 1960's. My angel holds court beside an ornament from 1991, the year my oldest son was born. Another of my most precious ornaments is this handmade snowflake that frames a photo of my mother when she was a tiny girl. 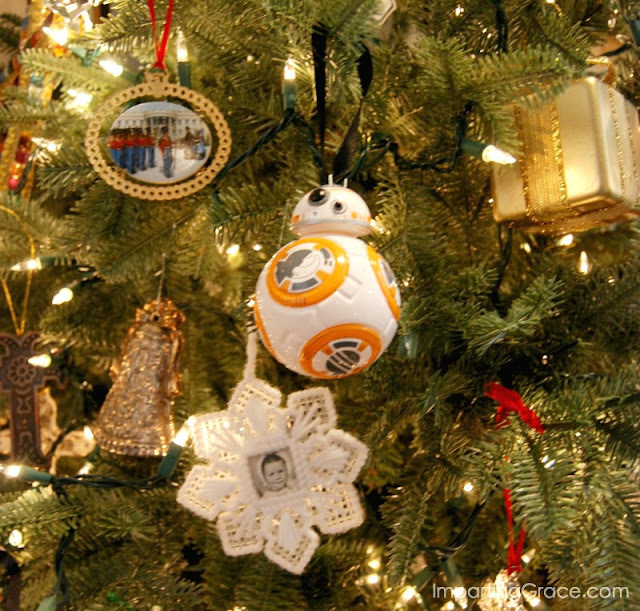 But you'll notice BB8 from Star Wars hangs just beside her. 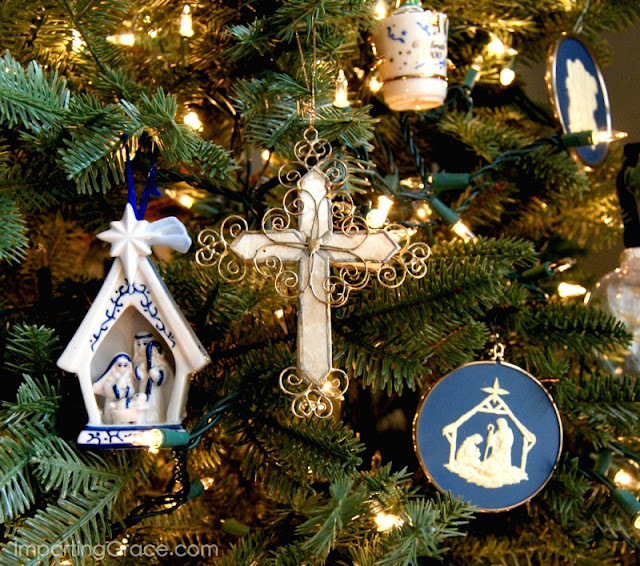 And so it goes all around the tree: the old mixed with the new, the precious with the cheap, the sacred with the secular. Not fancy or fashionable, but just right for us. What these photos don't show you is that lurking in the corner of the living room are bins of Christmas decorations. See? 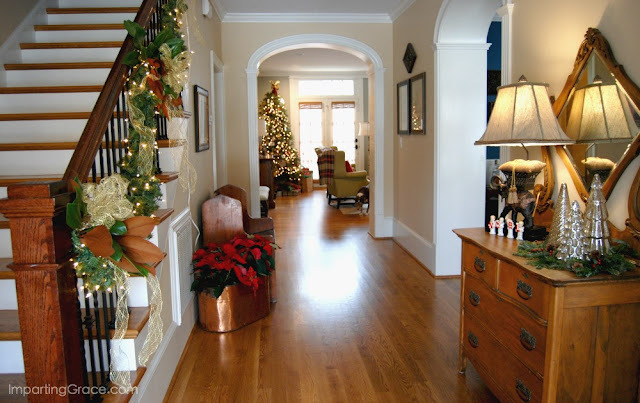 At first, as I considered the fact that my Christmas decor is still a work in progress, I thought to myself, "I feel guilty that I haven't already finished the decorating and put all the boxes away." Beautiful thought and reminder along with your beautiful tree. Thank you. Funny Richella, I just strolled through photo albums and posted pictures of all many of our trees from the 1960's when I was just a child and thought every Christmas tree was amazing beautiful. I still do think that. I always figure if I get the tree up I am good. The other is icing on the cake. I think Instagram and the constant posting of beautiful pictures which we all love makes us feel a little less than. 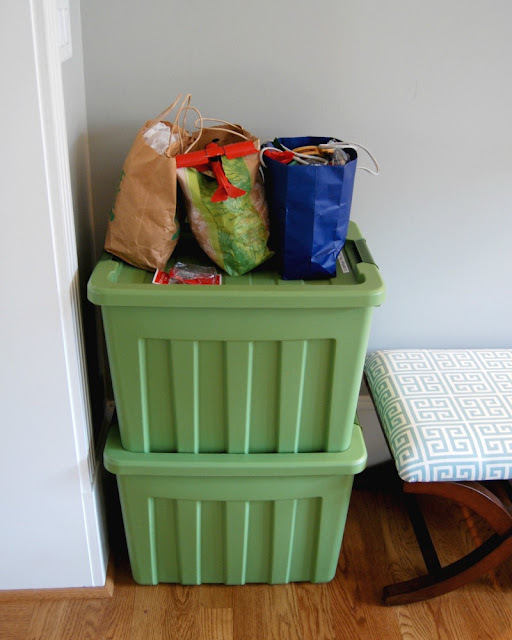 Life is tubs of Christmas just sitting in the corner waiting for us to have time to put them away. Thanks for keeping it real. I do to this day think your home is beautiful. It is a classic and timeless home filled with things that tell your story. I needed to read this. I was starting to lose the joy of Christmas today due to a lot of stress. Thank you for the sweet reminder. So, so beautiful Richella! Your home and your words. ♥ Thank you for your testimony and hope you give. What a beautiful post, in image and in word. Guilt can certainly eat us up for one reason or another but thank God He has already taken that away if we only remember it...especially at Christmas. Wonderfully said! Great thoughts and advice not just at Christmas but all year long. I love seeing your sentimental ornaments. Our tree is the same way with a mix of old and new and every ornament is special for one reason or another.